A pocket-sized 5.35 GHz USB spectrum analyzer! Always on the lookout for useful, but inexpensive test equipment, I recently ran across the Triarchy Technologies USB spectrum analyzer, model TSA5G35. The one thing that really struck me was the whole thing was built into a USB dongle, just a little larger than a memory stick. What’s more, the advertised frequency range was 1 MHz to 5.35 GHz. This, I had to see for myself. So, is a spectrum analyzer no larger than a pack of chewing gum that you can carry in your pocket good enough for EMC analysis and troubleshooting? For a total cost of $599 (through their store on eBay), I decided to take a chance and run this remarkable PC-based analyzer through the ringer. Figure 1 – Photo showing the analyzer with supplied USB extension cable and 30 dB attenuator. 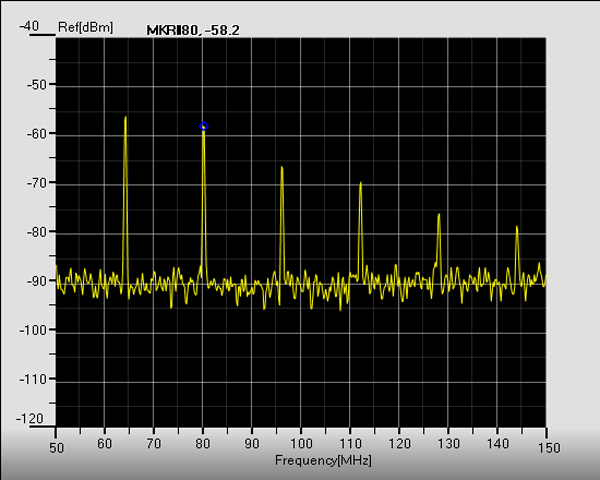 Figure 2 – A screen capture of a series of 16 MHz oscillator harmonics. SPECIFICATIONS – Basic specifications include frequency coverage of 1 MHz to 5.35 GHz, resolution bandwidths of 50 through 500 kHz (not selectable), frequency spans from 1 MHz to 1 GHz, input level range of -110 to +30 dBm (using the supplied 30 dB attenuator for the higher power levels), and typical noise levels of -80 to -100 dBm (depending on the span and RBW). The maximum power level is +20 dBm for 1 minute (without the external attenuator) and +/- 25 VDC, which is excellent protection for this little instrument. The reference level range is -60 dBm to 0 dBm (no external attenuator) or -30 dBm to +30 dBm (with the external attenuator. the usable display range is 80 dB with a noise floor of -115 dBm at a 5 MHz span and -60 dBm reference level at 1 GHz. Amplitude accuracy is specified at less than 3 dB. All in all, not to bad for this little guy. This entry was posted in EMC Measurements, Reviews, Troubleshooting and tagged Spectrum Analyzer, USB. Bookmark the permalink.